The 75cl Water-to-Go filters are built using nano technology developed by NASA for space programs. It is a combination of nano alumina, 33 percent carbon, and various other filtration components that remove 99.99 percent of almost all types of water impurities and provide you safe, healthy water to drink. 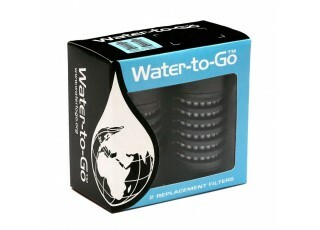 The unique 75cl filter is used for 75cl Water-to-Go bottles, which are perfect for camping and group travelling. Each filter can effectively treat 200 litres of water and make it pure from contaminants. Available in a pack of two, the 75cl filters make Water-to-Go bottles a cost-effective and environment-friendly choice over bottled water. The 3-in-1 75cl filter efficiently removes 99.99 percent of all bacteria, viruses, heavy metals, etc., to offer you safe, healthy water. The filter lasts for 3 months or treats 200 litres of water, and has biodegradable filter membrane and recyclable end caps. The 75cl Water-to-Go filter only functions when damp. On first time use, fill up the bottle and invert it to keep the filter submerged in water for 20 minutes. Once activated, the filter provides you a consistent supply of pure water. A silicon technology is used to offer added protection against leakages. Screw the filter tightly on the lid to provide a seal between the lid and the filter. Repeat the same procedure when capping the bottle to prevent water leakage. The products are sent within one business day of receipt of your order and the payment amount to our account .